Why Is Proper Electronics Disposal Important? 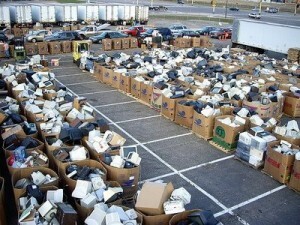 The staff here at BoxQ Electronics is dedicated to furthering environmentally conscious electronics disposal practices. That nation’s landfills aren’t getting any smaller, and throwing out broken and used electronics can violate state and federal laws. In the not so distant past there were few options when it came to the disposal of electronic equipment; the local dumpster was often the only option for getting rid of old or broken electronics. Careless and improper disposal of electronic equipment can create environmental damage akin to toxic waste. New technology is exciting for businesses and consumers alike. While the rush to purchase new electronics can boost business and the overall economy, this consumer rush can also have a downside. A good example of this is the explosion of popularity seen with flat-screen televisions. The advent of flat-screen filled dumpsters and garbage cans with older, tube based televisions. In the past, broken and used tube televisions were scrapped for parts and resold for profit. As a result of the new technology, consumer demand for tube televisions plummeted, leaving recyclers and resellers with massive quantities of useless equipment. These televisions were built with lead based glass, making stockpiles of them a serious environmental risk. The response to this problem was to simply store them in warehouses, incinerate them, or worst of all, send them to landfills. Increasing environmentally consciousness has fueled the development of new recycling and technology for waste of all types, including electronics. Our team here at BoxQ Electronics specializes in eco-friendly disposal and recycling, following a zero-landfill policy. Our business helps our customers properly dispose of unwanted equipment, developing custom tailored solutions for businesses and individuals alike. We are proud to be a part of the fast moving eco-friendly electronics disposal industry. For more information on BoxQ Electronic recycling and disposal services, call us at (877) 499-BOXQ.